At the Policy step of the wizard, specify how you want to store backup files on extents of the scale-out backup repository. Select Data locality if you want to store backup files that belong to the same backup chain together. In this case, a full backup file and subsequent incremental backup files will be stored to the same extent of the scale-out backup repository. The new backup chain may be stored to the same extent or to another extent (unless you use a deduplicating storage appliance as an extent). Select Performance if you want to store full and incremental backup files to different extents of the scale-out backup repository. If you set the Performance policy, you must make sure that the network connection is fast and reliable so that Veeam Backup & Replication can access all backup files from the backup chain. For more information, see Backup File Placement. If you select the Performance policy, you can restrict which types of backup files can be stored on a specific extent. For example, if you have added three extents to the scale-out backup repository, you may want to store full backup files on one extent and incremental backup files — on the other two extents. 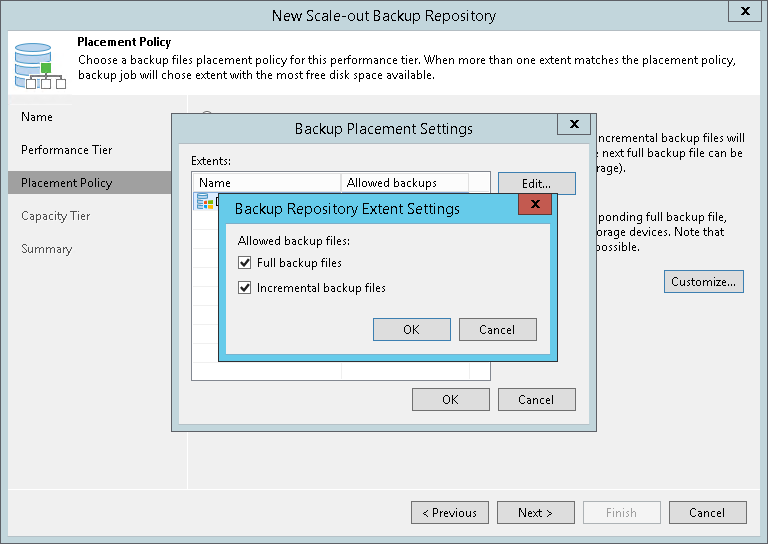 In the Backup Placement Settings window, select an extent and click Edit. Select a check box next to the type of backup files that you want to store on the extent: Full backup files or Incremental backup files. By default, Veeam Backup & Replication can store both full and incremental backup files on the same extent.